With a budget, it's easy to get used to how much money you spend because you are so accustomed to seeing the total on a monthly basis. Instead of helping you spend less, you are actually training yourself that your current level of spending is necessary. Then there's the problem of actually doing the work. Many people who have budgets often forget to add up a receipt here and a receipt there, which makes the whole budget unreliable. And in reality, having a budget doesn't automatically help you spend less anyway. Some people feel that as long as they see what they are spending money on, they will stop. This is just a pipe dream. It sounds obvious, but unless you take the effort to spend less on a particular habit — something you can do without a budget — your spending won't go down. Try these tips to lower your spending without starting a budget. This isn't easy for some people, as you can imagine, but eliminating almost all of your expenses and starting from scratch will help. What I mean is to treat every bill, every meal out, and all your automatic payments as expenses that you truly cannot afford. Once you scrutinize every detail of what you pay, you will find that part of your spending is on things you don't really care about, and you can start reducing. The fastest way to spend less is to have less. When you have less to spend money with, you will find a way to survive. We obviously don't want to voluntarily decrease our income, so the closest thing we can do is pay ourselves first and then pretend we have less. That's why we should schedule our deposits to our retirement accounts the day we get our paychecks and to increase our savings amount every time we get a raise. If we don't get a chance to use it, we probably won't. Another way to lower your spending is to think of ways to work on your debt payments. From refinancing to moving debt around to lower your interest rate, there are many ways to reduce your debt in order to lower your monthly obligations. Don't forget about this side of the equation, because spending some time here can reap huge rewards. 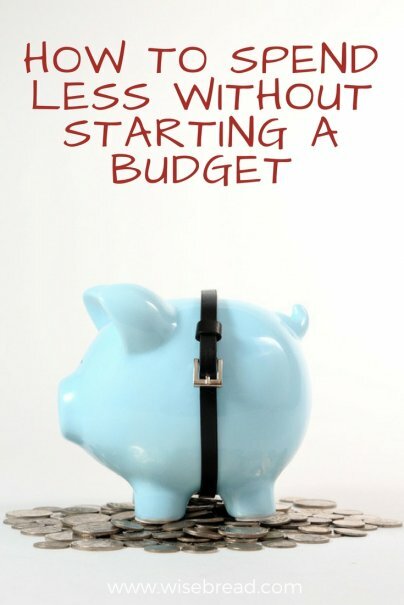 Having a budget is good only if you have the discipline to keep up. As with everything else in life, there are more than one way to skin a cat. Has anybody tried any of these methods without a budget? I'd love to hear how they worked out. I like your idea about starting from scratch. It is so easy to start feeling like you need everything you have and start getting run over by your monthly spending that you don't even need! I have been working for 25 years and I still do not understand the Budgeting - I guess that means I have always had enough money, which is a good thing. I max out my 401K and a Roth IRA and also contribute to monthly stock purchases. I then spend whatever I spend and save the rest. What is the value of budgeting? Part of the reason why people shy away from budgeting is because it gets to overwhelming. If you have a category for everything it gets very time consuming. Personally, I took a look at all of my bills and tried to reduce each of them in some way. I switched cell phone carriers, raised my car insurance deductible, dropped the DVR, and stopped drinking soda. Little changes can make a big difference! I especially like you advice about paying yourself first. It is a must! I am an all-or-nothing kind of person, so the starting from scratch sounds really appealing to me. When I first started budgeting, I had the idea that just keeping track of things would make me more aware and less likely to spend unnecessarily, but that isn't going to just happen. Considering everything you spend on with an open mind and thinking about what you really want and need, I think, can really lead to saving in a way that just budgeting might not. I like "pretend you have less"! One of my 2012 goals is to save or donate 50% of my take-home income. I've been pretty close to that over the past few months, so I thought I'd stretch a little next year. I do it through automatic savings transfers, so that I don't see the money in my checking account. Fortunately, I make enough that I *can* live in this area (with few frills, anyway) on half of my salary. After taxes, I will have significant savings that will fund my goals of a debt-free wedding (2012), a debt-free graduate degree (2013), and a down payment on a house (2014 or 2015).